Nutone micro-lined vacuum bags are constructed with 2-ply electrostatically charged filter media. This allows them to capture particles at 85% efficiency down to .10 microns. They also feature a dust seal closure for protection during bag changes. Nutone recommends replacing these about twice a year with typical use. 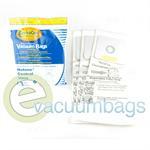 For the VX550 and VX1000 vacuum models, Nutone also manufactures 8 gallon HEPA bags. These teflon-lined HEPA bags offer the ultimate in efficient filtration, with superior airflow and minimal clogging as well as anti-bacterial protection. Filtering to HEPA standards means these bags capture particles down to .3 microns in size with 99.97% efficiency. Nutone vacuum bags come in 2 sizes, 6 gallons and 8 gallons, please make sure the bag is designed to fit your model of Nutone vacuum. 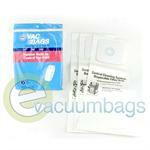 Genuine 8 Gallon Paper Vacuum Bags for Nutone VX550 and VX1000 Central Vacuum Cleaners. 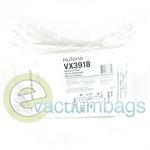 Generic DVC Paper Vacuum Bags for Nutone Central Vac 391, CV350, CV353, CV450, CV653 and CV750. 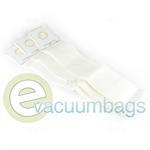 EnviroCare Micro Filtration Paper Vacuum Bags for NuTone Central Vac Canister Model Vacuums.